"From my first day, every one has been very supportive, and afforded me every opportunity to grow as a student." This spring, NJIT’s 2018 College of Science and Liberal Arts Awards honored an exclusive group of its undergraduate and graduate seniors with the CSLA Outstanding Student Award — a distinction annually given to students who have demonstrated the highest level of excellence in their field. 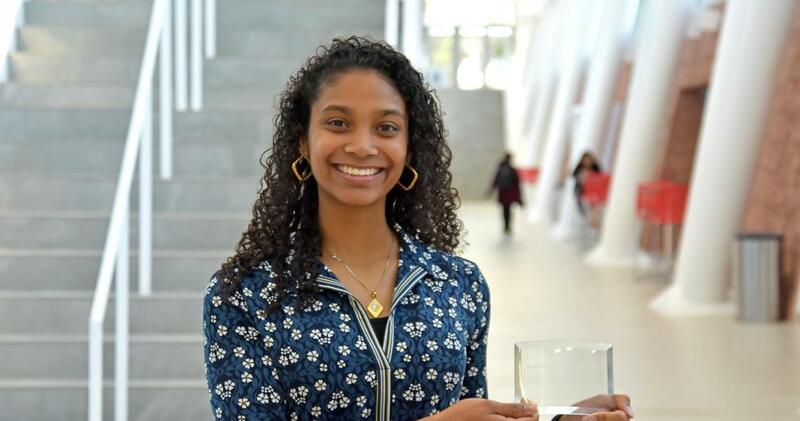 We caught up with four of the college’s most exceptional senior students selected for the award to let them reflect on their time at NJIT and share what the future holds for them after graduation. Where did you grow up and what led you to NJIT? I grew up in China and came to the U.S. in 2013 to pursue a Ph.D. degree in chemistry. I originally studied at the University of Central Florida but followed my advisor there, Dr. Kevin Belfield, when he came to NJIT as Dean of the College of Science and Liberal Arts. What research or academic focus were you engaged in most at NJIT before you won the 2018 CSLA Outstanding Student Award? My research is focused on the applications of fluorescent materials for ion detection, bio-imaging, and mechanism study for vascular function. I really like what I study now and will continue my research where my skills and knowledge fit well. After some interviews and offers, I accepted a position at Albert Einstein College of Medicine as a postdoc researcher. What important life and career experience will you take with you most from your time at NJIT? NJIT provides such a supportive environment for students. I participated in many workshops, conference or activities, such as the Army Educational Outreach Program held at NJIT, [and] the Science and Alliance Leadership Training held by the New York Academy of Science. Those were all very good experiences and opportunities for me. I grew up in North Plainfield, New Jersey. I chose to attend NJIT because it provided me the opportunity to continue my baseball career while attending a prestigious academic institution. My focus is in sports journalism and media arts. I have been fortunate enough to have had some great professors who have helped me obtain a recent internship at Athletic Network, which helps athletes plan their lives after their playing days are over. I will be pursuing a master’s degree in management at NJIT while finishing out my collegiate baseball career. The highlight of my NJIT experience was competing at the Division I baseball level in one of the best conferences in the nation. Getting the chance to take the mound every weekend against some of the top competition in the nation is something that I always embraced and looked forward to. I grew up in Linden, New Jersey but my journey coming to NJIT started at Union County Vocational-Technical High School in Scotch Plains. My junior year physics teacher had graduated with a B.S. in chemical engineering from NJIT and recommended I visit. I decided to look into it since family is very important to me and it was close by. Once I visited NJIT, I loved it! Out of the seven colleges to which I applied, NJIT was the only one for which I applied early action. I was blessed to participate in research activities such as the “EXTREEMS-QED” with NJIT’s math department. Three classmates and I worked alongside Dr. Michalopoulou exploring solutions to the challenge of detecting today’s smaller and quieter submarines in shallow water, where there are many interfering noises. I will be a secondary mathematics teacher in New Jersey! I met by best friend, Elizabeth Daudelin, here at NJIT. I found a sister in her and have grown so much as a person just knowing her. We have conquered math classes together, did research together, held positions on the E-Board for the Knitting and Crocheting Club together, and graduated together! College is not only about doing research and getting your degree, but about the people you touch along the way. It is about what you take from everyday. I'm originally from Nigeria, and moved to the United States nine years ago. I enrolled at NJIT because it's an IT school with lots of emphasis on research, which is open to the students. My research focuses on analyzing several spacecrafts, such as the Van Allen Probes, to understand the impact of interplanetary shocks on the magnetosphere. I plan on furthering my education and getting a Ph.D. at the University of New Hampshire. I'll be enrolling there this fall. NJIT has helped me a lot. This is probably cliché, but the supportive atmosphere provided to the students by the faculty here cannot be understated. From my first day, every one has been very supportive, and afforded me every opportunity to grow as a student. I'll also cherish the friends I've made along the way that helped me out of my shell, which was one of my goals prior to enrolling.